Sapa Building System is one of Europe’s largest suppliers of aluminium building systems which belongs to a leading international group that operate around the world and has activities in profile extrusion and heat transfer as well. It is formed out of 5 operating companies with product lines that are well known by the market. We unite those individual companies and link them through research and development, design, technology and best practice. As a whole, Sapa Building System aims to be the preferred European provider of environmentally sustainable and energy-efficient aluminium building system solutions, distinguished by service, reliability, technology and innovation.. Together with its worldwide network of metal, PVC-U and electrical partners, as well as architects, specifiers and investors, Schüco creates sustainable building envelopes that focus on people and their needs in harmony with nature and technology. Metal and PVC-U window, door and façade solutions from Schüco meet the highest requirements in terms of design, comfort and security. At the same time, CO2 emissions are reduced through energy efficiency, thereby conserving natural resources. The company delivers tailored products for newbuilds and renovations, designed to meet individual user needs in all climate zones. Everyone involved is supported with a comprehensive range of services at every stage of the construction process. With 4,630 employees and 12,000 partner companies, Schüco is active in more than 80 countries and achieved a turnover of 1.430 billion euros in 2015. 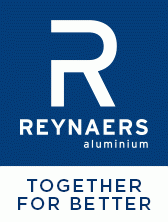 Reynaers is an aluminium systems supplier and a leading European specialist in the development and marketing of innovative and sustainable aluminium solutions for windows, doors, curtain walling, sliding systems, sun screening and conservatories. Driven by energy-efficiency and the willingness to take responsibility for the environment. Besides a wide range of standard solutions, we also develop tailor-made solutions for all market sectors – from residential to commercial and industrial projects. Our high-quality systems all meet the most stringent demands in terms of comfort, security, architectural design, and energy-efficiency. Reynaers is not only a supplier, but also a valuable partner— for architects, fabricators, solar installers, project developers, investors and end users.